The brain requires certain nutrients, along with a good diet and active lifestyle, to stay healthy as we age. 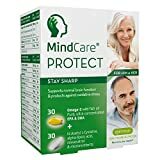 MindCare PROTECT brings you an advanced blend of bioactive nutrients that will help you maintain a sharp mind and good memory, so you can keep your brain active and get the most out of life . MindCare PROTECT is a comprehensive formula that provides the essential omega-3 fatty acids EPA and DHA to aid brain function, in a specific ratio to support both brain structure and optimise cognitive function. Omega-3 capsules provide the recommended daily intake of 250 mg DHA for maintaining normal brain function, with an additional 410 mg EPA in each capsule for extra support with neurotransmitter function (the chemical messengers that facilitate cell to cell communication in the brain). The omega-3 wild fish oil in MindCare supplements is ultra high purity, sourced from deep-sea anchovies – these short-lived small fish are very low in the food chain and produce a very pure oil. MindCare PROTECT provides targeted support for healthy ageing with a bespoke fast-acting micronutrients capsule providing nutrients that work in synergy with omega-3 fatty acids to keep your brain active. N-Acetyl L-Cysteine, alpha-lipoic acid and resveratrol are combined with essential vitamins and minerals including B complex, vitamin D3, folate and zinc. Together, these active ingredients help protect memory, provide protection against oxidative stress associated with mental decline, and support energy production within brain cells – essential to help with mental clarity and maintain mental performance, energy and concentration. Each box contains 60 (30 + 30) capsules, providing a 1-month supply at a daily dosage of 2 capsules.